This December marks the end of my first full year of blogging, and over the past 12 months I have been fortunate enough to have tried a lot of beauty products! While many come and go, there are a few products which I continue to reach for. There are lots of products which I’ve raved about this year, but here are some which perhaps I’ve not hyped up so much on the blog (probably because they are trusty, timeless pieces!) and some which I’ve written about lots, but couldn’t possibly do a favourites post without mentioning them! Clarins BB Skin Perfecting Cream: this was a tricky decision as I’ve tried lots of bases this year, and loved so many of them. The Clarins BB cream is the one I reach for when I want a glowing, even complexion without applying too much makeup. Another base which has skin loving ingredients is the Clinique Superbalanced Makeup foundation which I featured in my Perfect Skin, Bold Lips post here. To add warmth, I usually go for the Bobbi Brown Illuminating Bronzer – it’s lasted me so long, but really is hitting the pan now! Next for me to try will be NARS Bronzing Powder, I’ve heard so many great things! To shape, I’ve recently started using the Bobbi Brown Shimmer Brick Compact. I’ve owned this palette for ages but was never really sure what to do with it until my fab friend Vicky pulled it out of her makeup bag and used it as a contouring product. I love the colour, it looks very natural but there’s a subtle shimmer which looks really lovely! For colour, the Clinique Chubby Stick Cheek Colour Balm‘s really took me by surprise, I now reach for them over my trusty powder blushers. Very battered, and yet so well loved is my Mac Studio Fix Powder Compact. I don’t know what I’d do without this in my handbag, I reach for it on a daily basis for afternoon touch ups and to rescue my shiny forehead! To set my makeup in the mornings, I use the Urban Decay De Slick Oil Control Makeup Setting Spray which also helps to keep my makeup in place. Since I first got the Urban Decay Naked 3 palette back in March (see my initial thoughts here!) it has been the palette that I keep going back to for my everyday, and often my evening looks. I find the shadow shades are absolutely perfect for my skin tone and hair colour. When I remember, I also use Urban Decay’s Potion Primer which helps the shadow to last even longer. Under my eyes, I normally use the NARS Creamy Concealer, but in my makeup bag I’ve got the Origins Plantscription Concealer which is really similar and also has anti-aging benefits! For a skinny black eyeliner, I’ve been absolutely loving the black liner from Zoeva Cosmetics, my full review is here. If you’ve been reading my beauty posts regularly then you’ll know how much of a fan I am of Seventeen’s Falsifeye HD Mascara – hands down the best budget mascara I’ve even tried! A lot more pricey, but with fabulous results is the YSL Baby Doll Mascara, I’ve only discovered it recently but it makes my favourites list as it hands down beats all the other mascaras I’ve tried this year! For my brows, I have to admit that I’m not terribly loyal to any particular product, I love trying new ones, but the ones which are ultra trustworthy and that I find myself coming back to are the Clarins Eyebrow Pencil which I raved about here, and also the Eylure Brow Gel to set. Recently I’ve also been loving Revlon’s Brow Gel Pencil, it’s a double ended product with a pencil and gel, ideal for popping in your handbag! I’ll be doing a full review very soon! Makeup wise, finally my favourite lip products. Ive tried lots of balms this year, but now that it’s getting colder, only the best will do! I always use Clarins Hydraquench Moisture Lip Balm, it has SPF and helps to heal and protect dry lips. To add colour, I’ve been loving Bobbi Brown’s Art Stick in Rose Brown, I reviewed it here and still get compliments whenever I wear it! I also am so impressed by the Rimmel Provocalips Lip Colours, my favourite shade is Make Your Move and i’ll be reviewing them soon! I’ve only recently started using lip liner ( I know, bad beauty blogger!) and so far my favourite is from Clarins, I love the selection of shades that they offer, and they have such a wonderfully soft texture, I often end up filling in my entire lips with the shade. 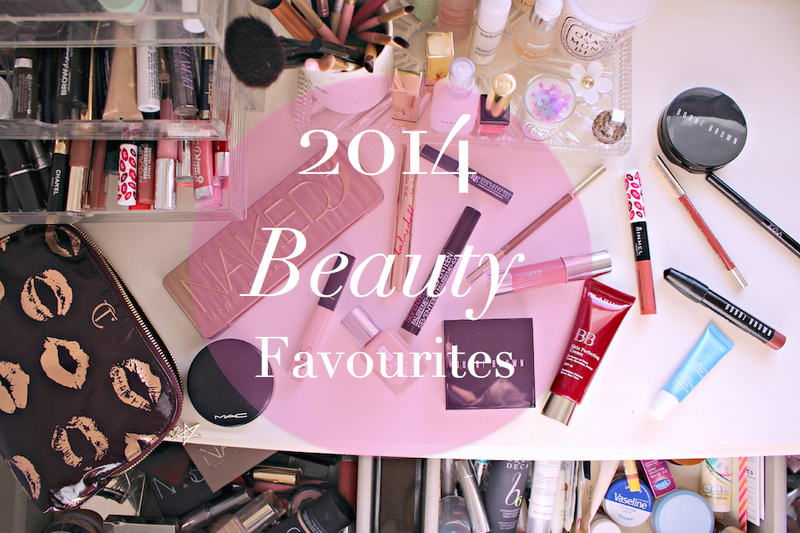 I couldn’t do a favourites post without mentioning these products! They are my four standout products that I’ve discovered and are know essentials in my skincare routine. 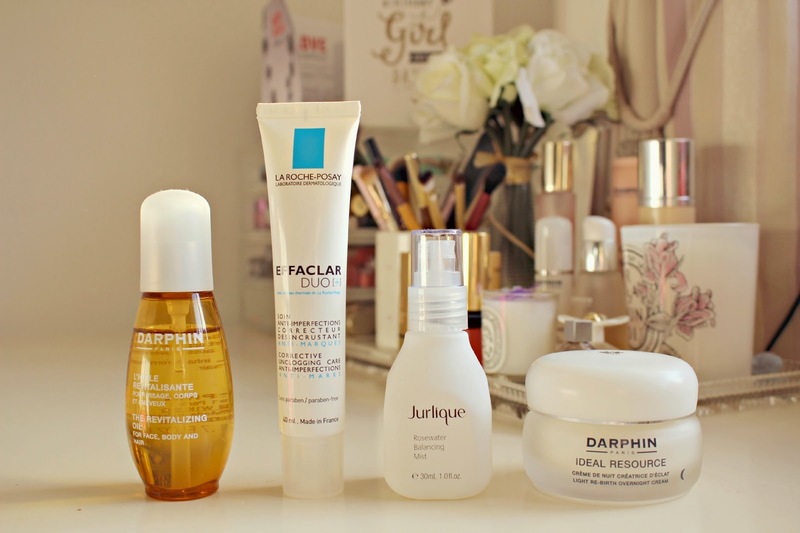 Darphin has probably been my favourite brand to discover this year, I’ve enjoyed the most incredible facial from them (review here) and have also raved about their skincare in numerous posts. The two products that stand out the most are their Revitalizing Oil which I’ve enjoyed applying every evening before bed, and also their Ideal Resource Overnight Cream. Each evening feels like a full pampering experience when I use these products, and I can’t wait to try more Darphin in 2015! Also a standout skincare product, Jurlique’s facial mists. They are so quick and easy to use, and now that I have to fly more with work, they have been absolute saviours for refreshing my skin during long haul flights, as well as being a desk essential to pep up my skin after hours of staring at a screen! You can read my review on the mists here. What have been your favourite products of the year? Do you share any of mine? Previous Post Fashion Mumblr 2014 Blog Survey & Giveaway!